AP Employees PRC PF/ CPS Arrears SR Entry - Model PRC Arrears SR Entry : How to PRC Arrears in Service Register. AP CPS Employees.Pay Revision Arrears SR Entry Model Form. 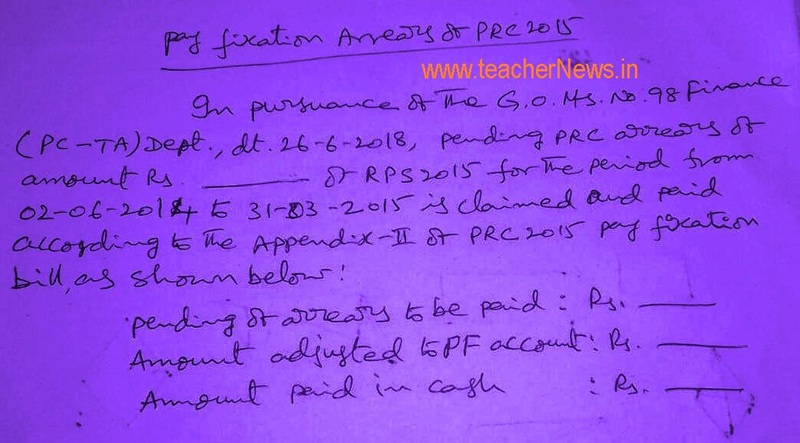 AP Teachers PF and Net Cash entry in Personal SR. In pursuance of instructions issued bu Govt. of AP Vide G.O Ms.No:98 Finance (PC-TA) Dept. Dated 26-06-2018. The PRC 2015 arrears from 02-06-2014 to 31-03-2015 paid to individual as follows. The arrears amount is claimed vide proceedings Rc. No _________ Dt:_________________ of the _____________________________MEO/ HM/ Dy.EO ________Division. AP Employees PRC PF/ CPS Arrears SR Entry - Model PRC Arrears SR Entry.